Autodesk has recently created new customer videos that showcase very small businesses (1-25 employees) or small groups with larger companies and how they’ve used AutoCAD and Autodesk products to create designs for their clients. I always think it’s interesting to see how different companies use software to be more competitive and productive. Brad Miller of MC², an exhibit marketing company, discusses how Autodesk 3ds Max and AutoCAD are used to help design and build exhibits that demand attention at tradeshows. The video uses a recent project for John Deere to illustrate how MC² relies on Autodesk software to deliver increased visibility for their clients. Eric Hebard of Production Resource Group, a supplier of entertainment and event technology, discusses how AutoCAD, AutoCAD WS, and Autodesk Sketchbook Pro are used to help design system installations for theaters and stadiums. The video uses an annual project for the Latin Grammys to illustrate how Production Resource Group Las Vegas relies on Autodesk software to create PA system installation designs and communicate that information to their clients. Mark LaBell and Steve Kassab of SSOE Group, an international engineering, procurement and construction management firm, discuss how AutoCAD is used to help seamlessly combine multiple files and file types into one design. In this video, SSOE elaborates on how the AutoCAD development language allows both the novice and experience programmer complete control over the application to create and edit complex designs for their clients. Natalie Cutler and Elisa Leung of Cutler Design and Construction, an interior design and general contracting company, discusses how AutoCAD LT is used to help design and build commercial retail spaces. The video illustrates how Cutler Design and Construction relies on AutoCAD LT to turn vanilla spaces into polished retail locations that follow corporate design guidelines. Ed Hade from Shaw Industries discuss how they moved from 2D to 3D with AutoCAD to maximize use of space in their new Reclaim-to-Energy facility—part of a green initiative to reduce post-industrial waste by recycling old carpet into energy. Fix for the persistent sync errors in the System Tray. Refer to the readme file for installation instructions. Specifically “Within the Autodesk product sign out from Autodesk 360.“ The readme also says “If you have installed Autodesk product service packs from the products above you may already have this service pack installed through them.” From what I can tell Autodesk Sync 2013 Service Pack 1 is not included in AutoCAD 2013 Service Pack 1.1 because the version I have for AdSync.exe is 4.0.5.4. AdSync.exe should be "3.5.102.0" when Autodesk Sync 2013 SP1 is installed. The product key functions have some news in Visual LISP for AutoCAD 2013. These are extended functions provided by VLISP. You must issue vl-load-com before you can use the functions. VLAX-MACHINE-PRODUCT-KEY - Returns the AutoCAD product key from the Machine hive in the Windows Registry. (ie. "Software\\Autodesk\\AutoCAD\\R19.0\\ACAD-B001:409") VLAX-MACHINE-PRODUCT-KEY replaces VLAX-PRODUCT-KEY in releases AutoCAD 2013 and later. In AutoCAD these 2 strings will always be identical. The strings will only be different in Core Engine host applications other than AutoCAD. VLAX-PRODUCT-KEY - Returns the AutoCAD Windows registry path. Old function, still available. The Core Engine host AcCoreConsole.exe that ships with AutoCAD can be configured to run ’isolated’ in which case the vlax-user-product-key will return a different string than vlax-machine-product-key. Normally, it shares the HKLM/HKCU keys with AutoCAD. However, you can configure it with the /isolate switch to use a different HKCU root key. The /isolate switch can be used to prevent the changes to the system variables from affecting regular AutoCAD. This is useful when you want to set sysvars or other registry based configuration setting for AcCoreConsole.exe but you don’t want these settings to change for your AutoCAD instance. When using the /isolate switch you also need to include an existing or new userid. Here AutoCAD registry product keys are explained further. The registry product keys are not the same thing as the Autodesk Product Keys that are used to differentiate products that are both sold independently and as part of a product suite. Have you run into a problem when the installer says on Configure Installation that AutoCAD is already installed and trying to clear out remaining folders, files and registry keys does not help? AutoCAD is not installed but still the setup says it is. It might be that you had tried to manually uninstall AutoCAD (or Revit or whatever it is) and failed to do it 100%. What to do? This trick might help to solve the problem. Note that the GUID (the code at the end in italics) is different for different applications and versions so you might need to search in the parent folder or go through them all to find what you look for. Locate this folder and delete it with its content. Make a backup if you want to be on the safe side. Use regedit, locate this registry key and delete it with its content. Make a backup if you want to be on the safe side. After that hopefully you will find that you can run the setup and install AutoCAD or whatever product you had in mind to install. Now you know how to install AutoCAD even if AutoCAD is already installed even though it was just the installer thinking so. CAD notes is having a giveaway of AutoCAD related books, training videos and software (including some from JTB World). Check it out. ACA_db is an app/add-on from JTB World for AutoCAD Architecture and AutoCAD MEP. Make use of AutoCAD Architecture or AutoCAD MEP more fully in your BIM process. Property Set values can automatically be updated back and forth to one or many external databases. If you make changes to the Extended Data values within a Property Set they can be synchronized back to the external database. Any Property in a Property Set Definition can be exported and all editable Properties can be imported. With the new release ACA_db 4 there is support for AutoCAD Architecture 2013, AutoCAD MEP 2013, both 32-bit and 64-bit. ACA_db will improve the BIM process and experience and will improve quality of your data and remove redundancy and conflicts of data. The online Help for AutoCAD 2013 has had several problems and missing pieces. The good news is that now the Help is much better but with room for more improvements. To see the new Help press F1 within AutoCAD to see the updated Help welcome page or visit the online Help directly in your browser. At this point the update is for the English language. The update include new content, search enhancements, additional reference links for Command and System Variables, Glossary, FAQs. Filter on All Content, User, Developer or Administrator. Search filters making it easy to filter on Commands, System Variables, AutoLISP, ActiveX, DXF and .NET. Related References at the bottom of many pages are helpful. Welcome to the new The Hitchhiker’s Guide to AutoCAD—your guide to the basic 42 commands you need to create 2D drawings using modern AutoCAD or AutoCAD LT. I had expected the image to be clickable to navigate to the islands or command. Under the subject (island) Viewing I would expect links to more related references. AutoCAD Services & Support page needs to be updated for 2013. I still miss a table of contents, the User’s Guide and Customization Guide with their topics making it easy to navigate the help. No easy access (if any) to news about the 2013 version. Imagine that you want to learn about AutoLISP. Make a search for AutoLISP and the “not” function is the top result. Not that relevant at all. FAQs link on the start page is just a link to a search for “faq” and at the top FAQ for Autodesk 360 shows up. Not that relevant and probably not what most users look for. A search for the command alias SSM returns “No results found for ssm”. There is still work needed to complete the help. For example is Commands for Working with Arrays missing the -ARRAY command line command. -ARRAYCLOSE cannot be found in the search. Commands like ACPTOOLTIPS and AUTODESKCONNECTIONPOINT cannot be found either. ONLINETOMOBILE, OPENFROMCLOUD, SAVETOCLOUD, VIEWSKETCH, MTPROP, ARRAYCREATION AUTOLOAD, AUTOLOADPATH, ARRAYCREATION, DGNIMPORTUNITCONVERSION, DISPLAYVIEWCUBEIN2D, LISPENABLED, NOPREVIEWGRIP, NOPREVIEWHIGHLIGHT, ONLINEAUTOSAVEPATH, ONLINEFOLDER, ONLINESETTINGSSYNC, ONLINESYNCPROVIDER, ONLINEUSERNAME, PALETTEICONSTATE, PREVIEWDELAY, PROPPREVTIMEOUT, VIEWDETAILCREATION, VIEWDETAILEDITOR, VIEWSECTIONCREATION, VIEWSECTIONEDITOR are not documented. Search for HELP and the Help system will fail to work. You need to refresh the page. UPDATE 2012-09-19: This has now been fixed, thanks for the help Dieter. A tip if you want the URL to a specific help topic is to right click on the Add to Favorites icons and copy the link address. Search tip: This should really be documented in the help. To search for a phrase add quotes around it. To search only for any of several keywords use the operator OR between. For example Sheet AND Plot. When you search, a minus or dash means that you want to exclude the term. So searching for -ARRAY will not show up the -ARRAY command at all. But when minus is used on one word and you have to other words you will not get the expected result. Try to search for Sheet Stamp and it will show 14 results. Search for Sheet Stamp –Plot and there is suddenly 243 results. The first will work like Sheet AND Stamp while the second will work like Sheet OR Stamp but NOT Plot. See also the related help/documentation news: Visual LISP and ActiveX/VBA Comparison and AutoCAD ActiveX API History. The following table compares AutoLISP/Visual LISP functions in AutoCAD with the similar ActiveX, VBA, and Visual Basic 6 functions and operators. The ActiveX Automation equivalents are indicated by “AutoCAD.Application.” and the Visual Basic 6 equivalents are listed as a function or operator. This chart can be useful when you jump between working in different languages as well as if you know one of them and want to learn the other. If you were quick to install AutoCAD 2013 SP1 you might run into the Fatal error after applying AutoCAD 2013 SP1. If you didn’t and kept SP1 you can now just install SP1.1 without having to uninstall SP1. DL20327837 has the downloads for AutoCAD 2013 SP1.1 and DL20327876 has the downloads for AutoCAD LT 2013 Service Pack 1.1. We want to express our appreciation to all our customers who identified these issues and reported them to us. Their reports gave us the opportunity to improve the product and to provide you with the best solution in general design and drafting. We also thank you for your continued business, and for your feedback regarding this release. See also more details in the posts AutoCAD 2013 SP1 & AutoCAD LT 2013 SP1 and AutoLISP and VBA Security Controls in AutoCAD 2013 SP1. Microsoft Expression Web Server error: Web "<Stammweb>" ist ausgelastet. I recently got a problem to publish from Microsoft Expression Web 4 to my website. Strangely enough the error message shows in German even though the application is English as well as Windows and locale settings. Microsoft Expression Web: Server error: Web "<Stammweb>" ist ausgelastet. Versuchen Sie es später wieder. In the connection settings I use FrontPage Server Extensions and I have not changed anything after the point it worked and when it stopped working. My website host company could not find anything wrong either but after they restarted the server it worked again for me. The updated FlexNet (FLEXlm) version (based on Flexera Software’s FlexNet Publisher Licensing Toolkit 11.11.0) was released in August 2012 and is available as a public download as well as the updated License Administration Guide. No words about if there are any bug fixes but if you experienced unknown problems with the license manager it can be worth trying if updating will help. lmgrd.exe, lmutil.exe and lmtools.exe are all 11.11 now. Previous FlexNet Version 11.10.1 described. Just like with AutoCAD there is AutoCAD LT, there will be a Revit LT with lower price than Revit but limited functionality. Take a look and see if it may be relevant for you. Here’s some info about the upcoming Autodesk Revit LT 2013. Revit LT could help to make the move to BIM. The features in Autodesk Revit LT are specifically built to support Building Information Modeling (BIM) workflows for high-quality design and documentation. Use the intuitive 3D modeling tools to visualize and communicate your designs more clearly, and meet the demand for BIM deliverables. And create photorealistic 3D architectural renderings in the cloud with Autodesk 360 Rendering, available with Autodesk Subscription. How does Revit LT support the BIM process? Revit LT supports the BIM process by creating coordinated, consistent, and quantifiable information about a building project throughout design and construction. BIM helps give design professionals insight to their projects with the ability to keep design information upto-date, and extract information from the building model during any stage of design. This insight helps professionals design more efficiently, obtain earlier approvals, and deliver higher quality, more easily constructible projects with fewer complications during the construction process. Who is Revit LT for? Revit LT is intended for building design professionals working on projects that can be completed independently or with limited internal collaboration but could benefit from a BIM-based workflow to produce more accurate, coordinated designs and documentation. Revit LT is ideal for single users who do not need to collaborate in the same project file simultaneously with others in the firm, and who do not need access to energy or structural analysis tools. What is AutoCAD Revit LT Suite 2013 software? AutoCAD Revit LT Suite 2013 is a bundle consisting of Autodesk Revit LT 2013 and AutoCAD LT 2013 software with a single serial number and a single authorization code. This combination enables you to maintain your investment in AutoCAD LT, while, when you’re ready, offering the flexibility to move to BIM with help from Revit LT.
What are the differences between Autodesk Revit and Revit LT? Not included in Revit LT: Worksharing (Multiuser Environment),Autodesk 360 Energy Analysis for Autodesk Revit, Near-Photorealistic Rendering within the Product, Conceptual Massing, Adaptive Components, Exports to gbXML, and IFC file format, Interference Checking, Copy/Monitor, Construction Modeling - Parts and Assemblies and Autodesk Revit LT does not support 3rd party API. Autodesk Revit LT 2013 stand alone price will be $1200 (MSRP in USD) and the AutoCAD Revit LT Suite 2013 will be $1500 (MSRP USD). You can save up to 50% when you upgrade from AutoCAD LT to AutoCAD Revit LT Suite. Sounds interesting? If so visit www.autodesk.com/revitlt. September 18, 2012 the 30 day trial for Autodesk Revit LT will be available and to purchase it you also have to wait a while more. There have been a number of changes to the AutoCAD ActiveX API since its first introduction with AutoCAD R14. Typically this API is used by AutoLISP/Visual LISP and AutoCAD VBA. SSMPropEditor is the Sheet Set Manager Properties Editor for AutoCAD based products and SSMPropEditor 4.6 is now available and comes with the addition of localization for Spanish and French as well as some bug fixes. The upgrade is free for customers that purchased any earlier version. Get the downloads here. 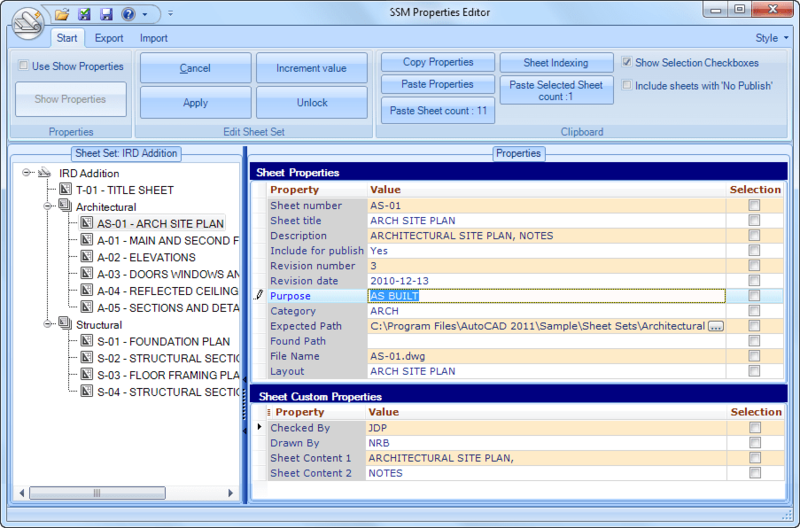 See also SSMPropEditor 4.5 released and SSMPropEditor as AutoCAD app.